Fake Fortnite Android apps are spreading around the internet, even though the game has not been officially released for the platform. Videos on YouTube with links to scam versions of the popular game have been viewed millions of times, according to security experts. None of the fake apps has made it on to the Google Play Store, but they are easy to find on search engines. According to one security firm, the apps look legitimate. Talking about one particular fake app, Nathan Collier, an analyst from security firm Malwarebytes, said: "It's so realistic that some may recognise it from the Apple iOS version. By stealing the icon directly from Apple, how could it not look real?" In fact the app redirects users to a browser asking them to download a number of other apps in order to play the game. The scammers are paid each time someone downloads an app from the website. Mr Collier said: "The bad news is that no matter how many apps you download, the game never unlocks, because it never existed within the malicious app in the first place. "Our advice: Be patient. If you wait for the official release by Epic Games in the Google Play Store this summer, you won't have to spend the ensuing months cleaning malware off your Android." Fortnite's most famous mode Battle Royale has more than 125 million players around the world. 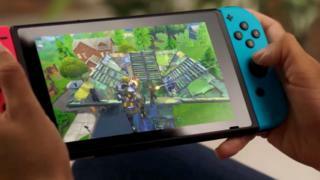 It means there are lots of people eagerly awaiting its debut on Android phones, due later this summer, with many using search terms such as "How to install Android" or "Fortnite for Android" in Google and YouTube. According to security firm Eset, many of the videos on YouTube have been viewed "millions of times". It warned that some of the fake apps could be malicious, attempting to steal a user's money or mining for crypto-currency using their device. A YouTube spokesperson told tech news website CNet that it had machine-learning systems to detect and remove millions of spam videos and that it removes such videos "when we are made aware of them".